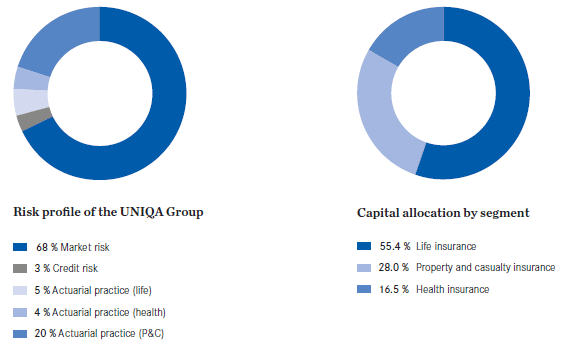 The risk profile of the UNIQA Group is very strongly influenced by life insurance and health insurance holdings in the Austrian life and health insurance companies UNIQA Österreich Versicherungen AG and Raiffeisen Versicherung AG. This situation means that market risk plays a central role in the UNIQA Group’s risk profile. The composition of market risk is described in the section “Market risk”. The subsidiaries in Central Europe (CE: Hungary, Czech Republic, Slovakia and Poland) operate insurance businesses in the property and casualty segment and the life and health insurance segment. In the Southeastern European (SEE) and Eastern European (EE) regions, insurance business is currently primarily in the property and casualty segment and particularly in motor vehicle insurance. This situation is important to the UNIQA Group because it creates a high level of diversification for the life and health insurance lines, which are dominated by the Austrian companies. The risk-specific particularities of the regions are also manifested in the risk profiles ascertained by the internal measurement approach. After every calculation for life, non-life and composite insurers in the UNIQA Group, reference profiles are created and compared with the risk profile for the respective companies. The reference profiles show that, for composite insurers, the relationship between market and actuarial risk is balanced. In addition, the highest diversification effect was achieved among the composite insurers.